A majority of Home Buyers are using the Internet to search for their next home. If you are one of these Buyers, then you should benefit from the work you're doing. The commissions real estate agents receive for bringing the Buyer are large these days and my Affordable Home Buying Service program provides a way for Buyers to get rewarded. Studies from the National Association of REALTORS have already shown that the over 85 percent of home buyers used the internet to search for their next home. The Internet buyer is more educated and takes less time when they are ready to buy a home. What I offer in my Affordable Home Buying Service is compensation for those Home Buyers who do their own research. I rebate the Home Buyer 25% of the NET commission I receive after brokerage fees. * For example, an average Flagstaff area $400,000 home offering 3% commission to the Buyer's Brokerage would result in a $2,400 rebate to the Home Buyer. If you know the type of house you want and are ready to buy if you find it, this program is for you! My website provides you with the information to help you with your research. This enables me to offer the Rebate program to you. I am always available to answer any questions and help advise you during your search. Once you do your research and are ready to buy, I'll take you to look at the homes you're interested in, do a comprehensive market analysis to determine what to offer, write the contract, negotiate the offer, and follow through until the escrow is closed and you have your new home! That's right!! 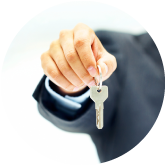 YOU STILL GET FULL SERVICE BUYER BROKER REPRESENTATION by an ACCREDITED BUYER'S BROKER. Real Estate transactions are complicated. You need an experienced broker, not just an agent, to guide you through the process. There are contracts, inspections, negotiations, disclosures, and multiple deadlines to name just a few. That is where I come in to handle all aspects of the transaction and represent you, the client. My goal is to make the transaction go as SMOOTH as possible so you can move into your new dream home. Home Buyer rebates of the commission paid by the Home Seller makes a lot of sense. The commission percentage is already determined by the Home Seller and stated on the MLS listing. So, the Home Seller already knows what commission they are going to need to pay. All that I'm doing is sharing my commission with a Home Buyer that is able to use my website to do the majority of their research. Prepare a CMA so that you make an informed decision when offering a price. Advise you on what comparable properties are selling for. Prioritize your goals and Help create a negotiating strategy to achieve those goals. Ensure that you receive and understand all state and federally required disclosure forms. Assist you in getting the best property at the best price with the least amount of inconvenience based on current market conditions. Prepare you for multiple offer situations and develop negotiation strategies specific to multiple offers. Get you to closing and serve as your trusted real estate resource. Assist in coordinating communications between the listing agent, lender, , title company, appraiser, and other professionals. Remain a life-long trusted advisor regarding real estate questions, needs, or concerns. Count on Vince your Accredited Buyer’s Representative (ABR®) to provide the highest level of buyer-representation services. Vince prepares, presents and negotiates offer. Manage the entire escrow process to closing. You move in to your NEW HOME! The Rebate Program is open to Home Buyers that don't have a current Buyer/Broker agreement with another agent/brokerage. You need to inform us if you've viewed any homes with other agents before we show you any homes. You must be pre-qualified with a lender of your choosing or verified cash buyer and agree to an Exclusive Buyer Broker Agreement with Innovate Realty, LLC before we show you any properties. Rebate is available only to buyers who close escrow/proceed to final settlement with Innovate Realty, LLC acting as their sole and exclusive broker in the purchase of real estate. The amount of the cooperating broker commission received will vary on individual properties. The rebate will be paid or credited to the party or parties named as the "buyer(s)" or "borrower(s)" on the Closing Disclosure Statement or equivalent official closing statement. This rebate program is only available where permitted under state and federal law and when not otherwise prohibited by the buyer's lender(s). There may be tax consequences to the rebate. If you need legal or tax advice, you should consult with the appropriate professional. Offer subject to conditions, limitations, exclusions, modifications, and/or discontinuation without notice.